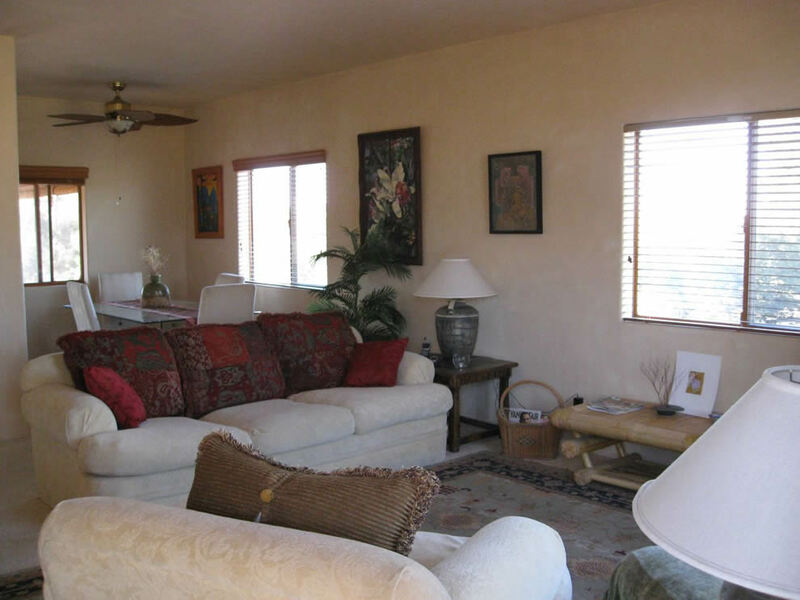 "My family and I had a magical weekend at the High Desert Eden and plan on going back again and again. 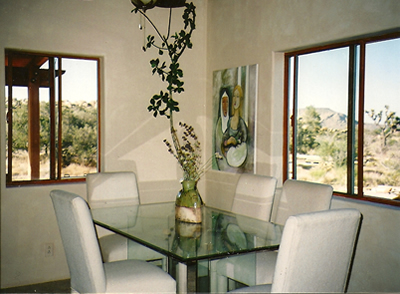 The view is even more wonderful than the photos can show and the home was very comfortable. I spent all weekend choosing books from the wonderful book shelf of treasures. In addition, my husband and son didn't have to get in their car to have amazing hikes. You wont need to leave the porch to be right in the middle of wildlife and the birds and bunnies will entertain you all day!" "The house itself, the surroundings, the hosts... gorgeous and unique. We're both cooks and the kitchen was well thought out and stocked with everything we might want or need. It just doesn't get better than this! The landscape, flora and fauna... Just stunning in its beauty and restful in its silence. I'm rejuvenated and ready to take on the world." 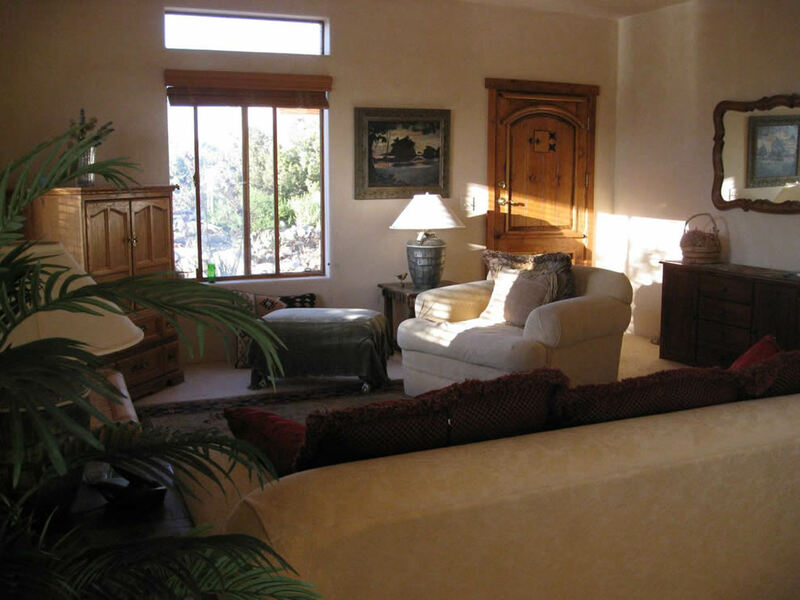 "I have stayed at the Casita on numerous occasions. I go there sometimes to deal with an artistic block, or to get away from the grind of the city, or just to relax in the privacy and open space of the high desert. 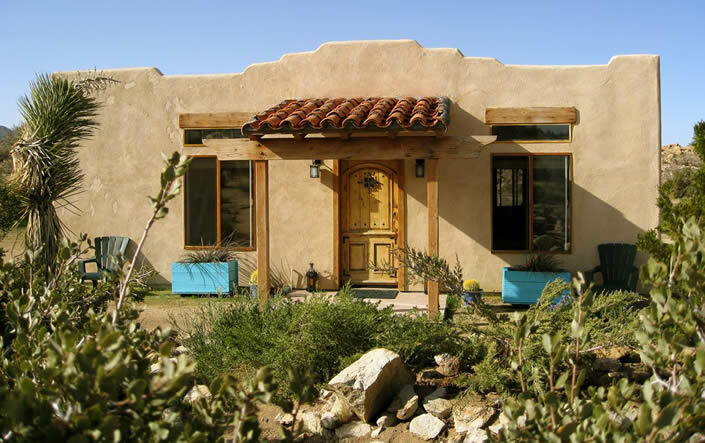 The Casita is a lovely one bedroom adobe style home with modern amenities and views of deserts, mountains, and rock gardens. There is a small pond with rocks and a waterfall that attracts wildlife and offers a serene place to contemplate. 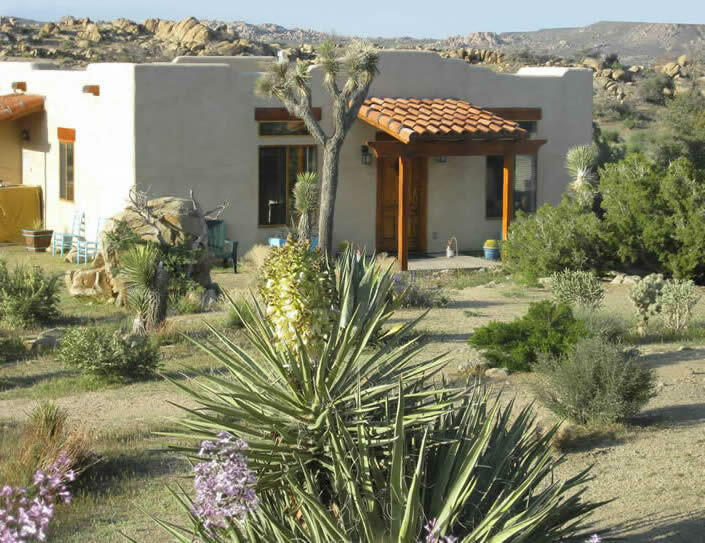 In fact, there are many places one can go to be alone on or near their property, including some secluded areas in the large rocks that the Joshua Tree Area is known for. Right now, it's Spring, and the wildflowers are the real stars. High season for flowers lasts until about the middle of May. There are plenty of places for hiking and exploring. Some evenings are spent out of doors in front of a campfire gazing up at a million stars, then retiring into a comfortable bed for a stress free sleep. 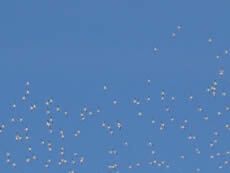 Mornings, one is awakened by the sound of birds, particularly quail, as the owners are fond of feeding the wildlife twice a day. I have found inspiration in the silence and solitude, and know that I will have no unwanted interruptions to disturb my painting if I so desire. When I do feel the need to interact with civilization, I simply drive for 15 minutes down to Yucca Vally where I can shop for anything from food to antiques. In 35 minutes I can be at the spa at Desert Hot Springs where mineral baths heal and soothe the mind and body. Robin and Max are great hosts. Their hospitality is unbounded, but they also know when to leave their guests to their own devices. Thankfully, I was able to work at their place before my last exhibition, and I was able to finish my new series "out of bounds", with colors inspired by the desert around me. 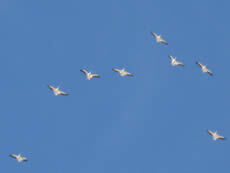 For me, the very land seems charged with creativity." 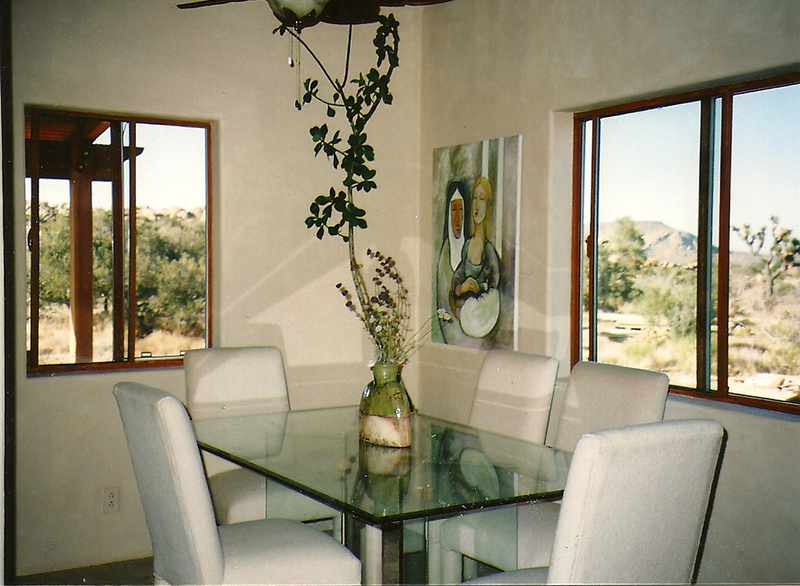 experience in the Joshua Tree area." 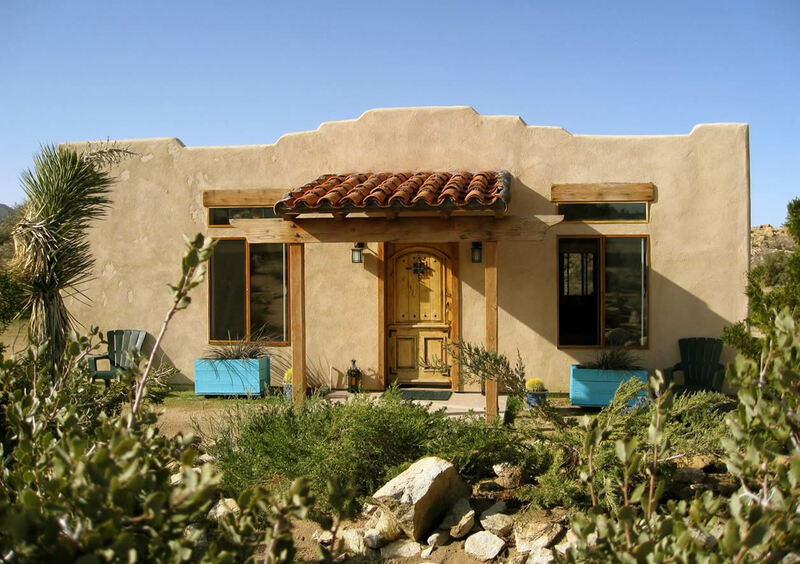 While High Desert Eden has recently been opened to the public, countless artists, writers, musicians, healers and yogis, parents and children have found peace, quiet and inspiration in this lovely "home away from home." 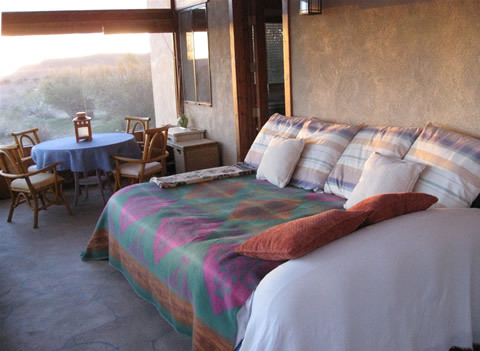 The wild, rustic outdoor landscape belies the style, luxury and comfort within our high-ceilinged, adobe-style casita. With its full kitchen, plush furnishings and 200 square foot screened and tile-roofed porch, you will want for nothing during your stay for a weekend, a week or more... during every season of the year. The dining room has a table that seats eight. The overlarge bedroom has a queen-sized bed and lots of drawer space so suitcases can be stowed away out of sight. 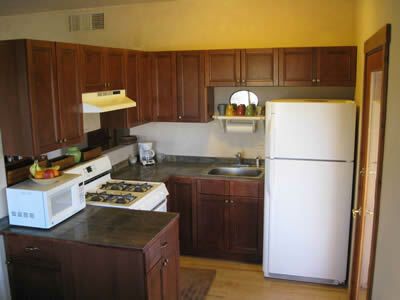 The Casita kitchen is stocked with coffee, tea, milk and sweeteners. You'll also find an assortment of condiments and spices. You'll find dishes, cutlery, pots and pans, mixing bowls, cooking and baking utensils, coffee maker, toaster, microwave, refrigerator/freezer, and range/oven. Where to buy provisions locally: Nearby Yucca Valley has four supermarkets (one with a huge organic produce section, and an excellent fish and meat department). Sue's is a brilliantly stocked health food store. Also in Yucca is an all-organic indoor farmers market seven days a week. 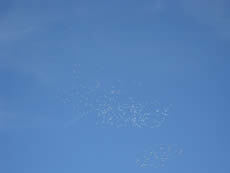 Outdoor farmers markets happen on Wednesdays in Yucca Valley and Saturday mornings a few miles farther in Joshua Tree. The casita has its own barbeque grill and screened sleeping porch - with sitting area and table. 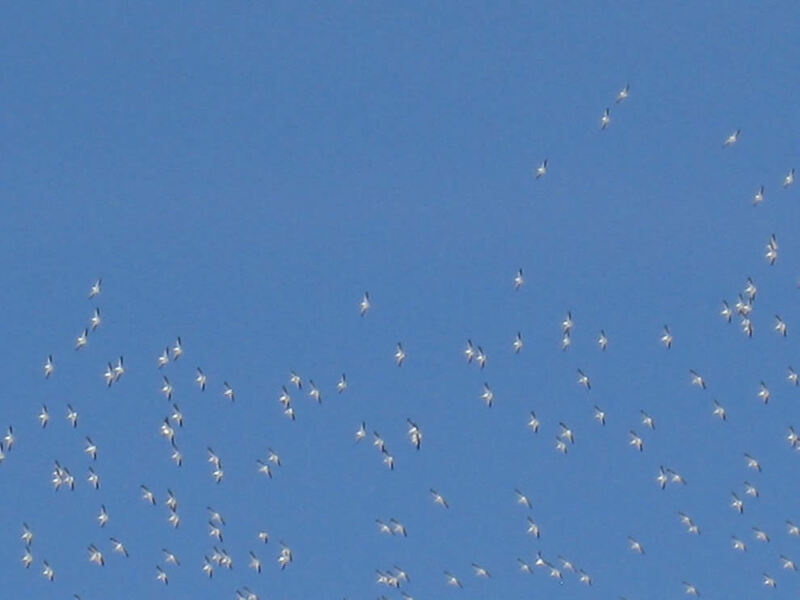 It's a great place to dine on balmy evenings or watch wildlife at dawn. Guests fight over the comfy queen bed. 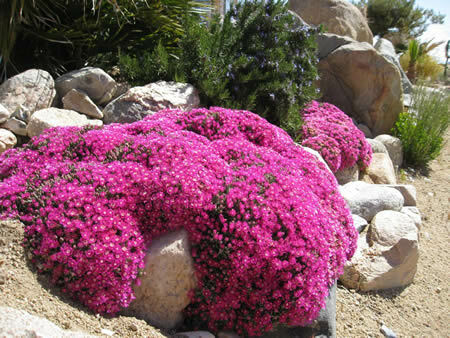 The near gardens of High Desert Eden are a xeriscaper's delight. 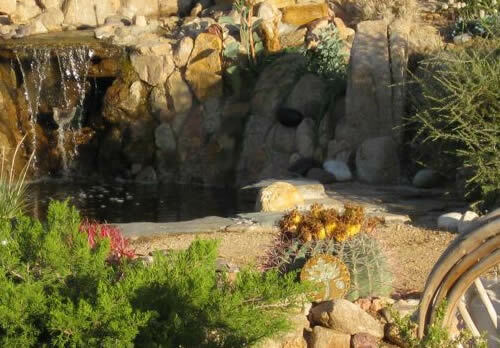 The Koi pond and waterfall attract every kind of wildlife. It's available for relaxation and a nighttime serenade from the "Gandhi Singers" (our delightful band of frogs). The necessities: Towels and linens provided in the casita, along with a hair dryer, iron, and clock. There is satellite television and free wireless high-speed internet access. Most cell phones will not work here, though there is always access to a landline in case of emergency. 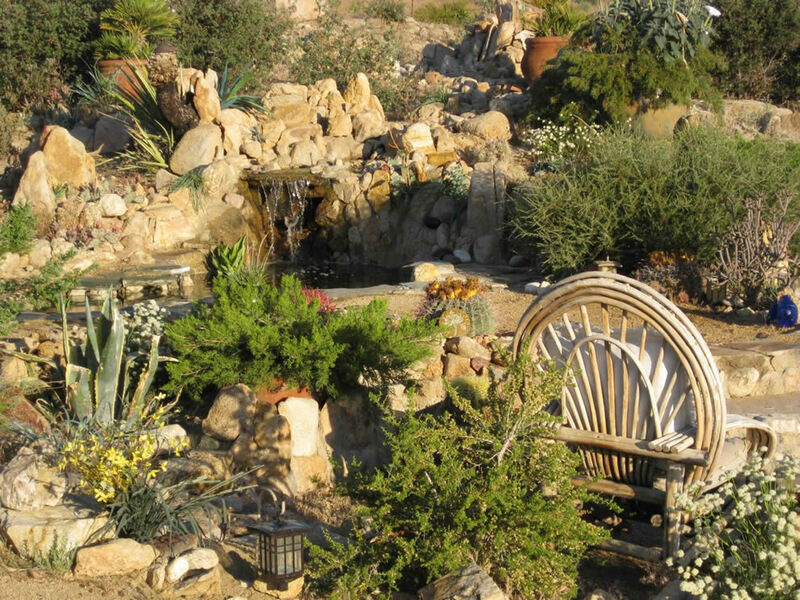 You'll be tempted to forget modern technology, instead taking advantage of the tranquility of High Desert Eden. Viewing: The Casita has binoculars to enhance your viewing of the magnificent 360 degree vistas, wildlife, the craters of the moon, and the Milky Way, which is visible almost every night. 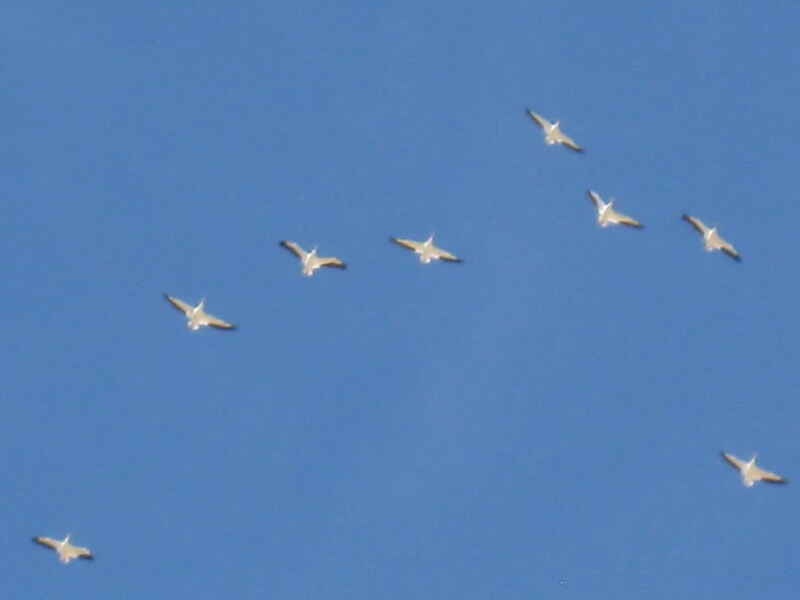 Below: This is a flock of White American Pelicans (9' wingspans) that flew over our property on their northern migration this spring (click on images for larger view).